In the Wachowski’s latest space opera, Jupiter Ascending, we meet Jupiter Jones (Mila Kunis), a girl who is having a pretty rough life. After losing her father as a child she grows up with her mother and her mother’s family cleaning houses, more accurately cleaning toilets in houses, in the family business. It’s a day to day grind which of course she hates. Then, along comes Caine Wise (Channing Tatum), a genetically modified human/wolf hybrid who saves her from some intergalactic bounty hunters sent to kill her. As the movie progresses Jupiter learns that not only did the human race not originate on earth but that she is in fact royalty. She possesses the exact same genetic makeup as the queen of a very powerful galactic royal family named Abrasax. The surviving three children are at each other’s throats over their inheritance which basically equates to control of the galaxy. In fact the eldest son, Balem Abrasax (Eddie Redmayne) is the one who sent the bounty hunters after Jupiter in the first place. As the movie progresses, there is a lot of stunning scenery and dramatic shots which are fantastically pleasing to the eye as well as others which are a little cheesy (there’s only some many times the wolfman can save Jupiter by skimming through the scene on his hover boots, before the effect gets old). Overall, the film had a lot of promise and the story was intriguing. While the film was not great I did find it enjoyable. On the plus side, it has a love story and some beefcake for the ladies and lots of sci-fi, explosions, and action for the guys. There are some holes in the storyline that I believe are caused by the multiple sub plots that aren’t fully developed. If you are expecting a cinematic space masterpiece look elsewhere. 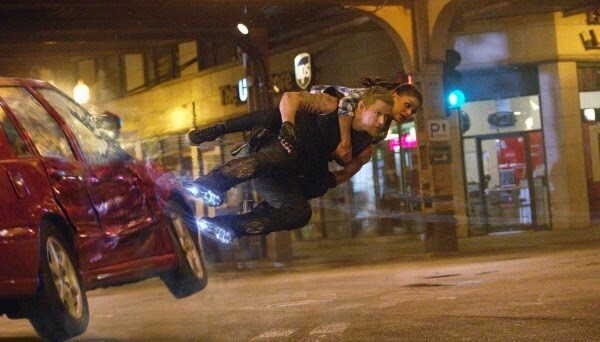 If, on the other hand, you are in the mood for a visually exciting film with a decent premise and can accept leaving with a few obvious questions unanswered, then by all means go see Jupiter Ascending. It was enjoyable enough that I would recommend a DVD rental or catching it on pay TV when it airs.